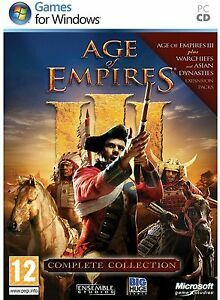 Get ready to build a feared empire with 'Age of Empires III: Complete Collection' for PC. This classic game allows you to establish a civilization from the ground up. From humble beginnings, you will build your empire with new buildings and constant expansion. You will also conquer any surrounding empires by training a tough and menacing army. This iteration of the beloved game has a variety of new mechanics and beautiful graphics that make the strategy game more enjoyable as you make your way through the lands. While it is a game, it will also help you learn about new cultures and how certain civilizations lived and thrived. The complete collection gives you hours of addictive gameplay. Take command of eight European powers between 1500 and 1850 A.D.
A good rts that takes little bandwidth and is easy to play. Great game, but I prefer the previous version! I have been an avid player of Age of Empires II, and decided it was time to upgrade. This game is great, the graphics are great. I use a Toshiba laptop with Windows 8, and the game runs perfectly and smoothly, but it is very loud when the disc is starting up. This is the only disc I have ever used with this computer that has sounded like that. It has no bearing on the running of the game, but could end up worrying someone who didn't know this ahead of time. Personally I prefer the AOE II, but this game is fun as well and makes for a nice "change of scenery" so to speak. This is a fun game I love the graphics and the pack that is is fun to play for hours. The only thing I do not like it that it is different from the old Age of Empires 2. You no longer have the option to build as many things as you did before, like the outpost which guard your base or where ever you put them you can only put down 7 of them and no more. Or you no longer have the options to build your own lumber yard or mining site, but on the up side the villagers can collect everything on there own. (with out a lumber yard or a mining site) The reason I bought this is because I love the Age of Empires series and I love this one to and this has both of the expiation packs with the game this was a great deal.